Cancer of any form can be devastating, and unfortunately some forms of treatment can take their toll too. One example can be seen in men who go through external beam radiation therapy to treat prostate cancer. Side effects vary for each person, but many report issues such as frequent, difficult, and painful urination, abdominal cramping, sexual dysfunction, and greater overall fatigue. However, a new study conducted at the University of Pennsylvania suggests that yoga can help alleviate some of these symptoms. The researchers began their study by splitting up two groups of men who underwent 6-9 weeks of external beam radiation therapy. During that period, one group participated in yoga classes twice a week and the other served as the control group. 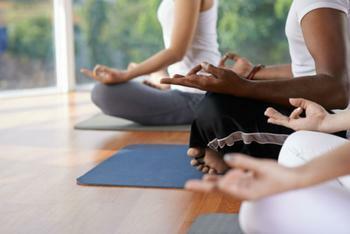 Each yoga class lasted for 75 minutes, with participants taking part in a variety of breathing exercises, centering techniques, and positions meant to encourage flexibility and strength. During the trial period, every participant was asked to report their level of fatigue and how it affected their daily life. Logs of these reports were kept and repeated throughout the study period. By the end of the study, the researchers were surprised to find that those who participated in yoga classes were less fatigued than their counterparts. Other measures, such as urinary function, also improved in this group. "Levels of patient-reported fatigue are expected to increase by around the fourth or fifth week of a typical treatment course, but that did not happen in the yoga group. Both the severity of the fatigue as well as the patients' ability to go about their normal lives appeared to be positively impacted in the yoga group," said principal investigator Dr. Neha Vapiwala. "Yoga is known to strengthen pelvic floor muscles, which is one of several postulated theories that may explain why this group did not demonstrate declining scores, as seen in the control group. That may also explain the yoga patients' improved urinary function scores, another finding of this trial." In addition to urinary function and fatigue improvements, the researchers found that the yoga classes helped participants overcome sexual dysfunction symptoms associated with radiation therapy. Participant who practiced yoga also reported higher levels of emotional well-being than the control group. The full study has been published in the International Journal of Radiation Oncology.